I managed to cook turnips, yellow squash, butternut squash, and bok choy tonight from my Barbee Farms CSA. I’m not really familiar with cooking turnips, but I have had them raw. They’re OK. I figured I couldn’t go wrong with roasting. Peel the butternut squash and turnips. Chop the butternut squash and turnips, along with the yellow squash. Toss them with olive oil in a bag to coat, and spread them on a non-stick coated baking sheet. Sprinkle with sea salt, pepper, and Garlic Gold and bake at 425 degrees for 30 minutes. In the meantime, I prepared the bok choy. Wash and chop one head of bok choy. Pour about 3 Tablespoons of soy sauce in a non-stick pan, and cook the white part of the bok choy for about 5 minutes on medium heat (since they take longer to soften). Add the rest of the bok choy and cook until the leaves are just wilted. Take off the heat and drizzle a little bit of toasted sesame oil and sprinkle with red pepper. So, the yellow squash turned out beautifully. It melts in your mouth and the Garlic Gold gives it a slight crunch. The turnips were a little bitter and firmer. Maybe they needed to cook longer…I don’t think I’m a fan. Maybe I just don’t know the best way to cook them. The bok choy was awesome. I can’t believe it cooked down so much. To give you perspective, what is on my plate is the whole head of bok choy (with the exception of a few stems). This is probably about a cup of bok choy. I made soup with the roasted butternut squash. 2 small butternut squash – peeled, chopped and roasted. 32 ounces of chicken or vegetable broth, or Trader Joe’s butternut squash soup. Saute the onion with the butter for 5 minutes over medium heat. Add the maple syrup to the onion and cook an additional 5 minutes on low heat. Add the black beans, corn, roasted butternut squash, and seasonings. Add the broth and water and turn to medium heat. Wait for the soup to come to a boil and then turn heat to low and simmer for 15 minutes. I ate one bowl and then froze the rest in freezer safe containers, so that I can take them to work for lunch next week. I promise something sweet tomorrow! So this is day three of sharing what I do with the veggies in my CSA box from Barbee Farms. Tonight’s highlight are these colorful bell peppers. 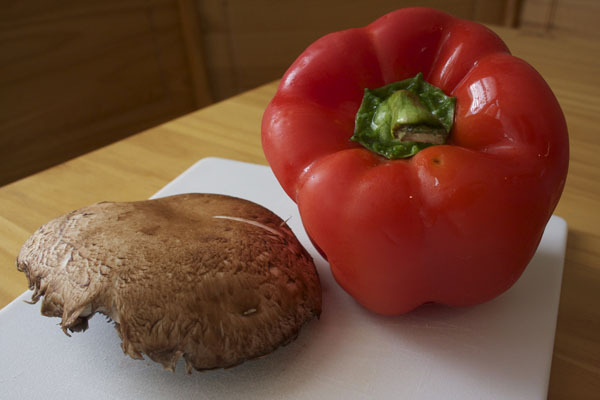 Bell peppers are high in vitamin C and A. Did you know that paprika is dried powdered bell pepper?! I just found that out from whfoods.com. I made Pineapple Cashew Quinoa with my lovely bell peppers. I recently found this recipe from Meganerd Runs and it is now my favorite way to make quinoa. It is a mix of quinoa, pineapple, cashews, basil, peppers, garlic, and soy sauce. You can also add in other veggies if you like. Meganerd Runs found this recipe in the cookbook Veganomicon. I’m not vegan, but I don’t discriminate! Quick – go to her website for the recipe!!! You will love it! Let’s start with the corn shall we? In a large bowl, sift together flour, baking powder, and salt. Add the milk and whisk until smooth. I had to add a bit more milk to make it smooth. Gently mix in the corn. In a large skillet, heat 3 Tablespoons of oil over med-high heat. Drop 3 Tablespoons of batter into the pan and flatten the mixture. Cook for 2-3 minutes on each side. These taste just like a pancake with corn in them. I like to call them corn cakes. Vee said “I like it, but it’s not something I’d order off the menu.” Don’t listen to him. They are delish. The corn makes them sweet and I love the crunch they give against the soft flour. 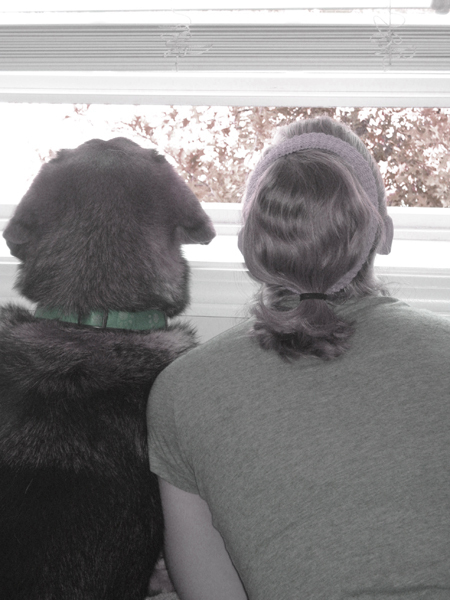 Charlie and I spent the rest of the day gazing out the window. Pancakes are for the weekends….or weekends are for pancakes?!? Either way, you should have pancakes this weekend. I’ve been using Martha Stewart’s Basic Pancake Recipe from her test kitchen. Sounds so official doesn’t it? I read a book by Dalia Jurgensen called Spiced, where at one point in her life, she had a job in Martha Stewart’s test kitchen. And you guessed it, she tested recipes and made food at different stages in preparation for Martha’s show on TV. Sounds like a pretty sweet gig to me. Back to the pancakes. I’ve been using all white flour, but for this instance I used half white and half whole wheat. These pancakes were special because we topped them with Chocolate Gravy. The Chocolate Gravy recipe comes from the kitchen of Beatrice Hoover Hill (Vee’s grandmother). Vee’s dad gave me the recipe and said that his family grew up eating biscuits topped with chocolate gravy. I decided pancakes were biscuit-like enough and we three musketeers set into action. While I made the pancakes, the oven baked the bacon, and Vee stirred the gravy. Charlie supervised, because you know, he’s an expert at making chocolate gravy and all. I was expecting the chocolate gravy to taste more like chocolate syrup, but SURPRISE, it actually tasted like traditional gravy with a hint of chocolate. It was good on the pancakes and wasn’t overly sweet at all. It will gel like pudding if you put it in the fridge, but doesn’t really make a good pudding because you can still taste the flour. It is a gravy after all. Whisk the dry ingredients together, then add the milk. Cook over medium heat, stirring constantly. Will thicken as it comes to a boil. Let boil until it reaches the thickness you like.